Do you remember Pavlova from Australia? She has been getting ready to sell lemonade to raise money for Mary's Meals. The lemons are from her friend Ashleigh's tree. There are so many! 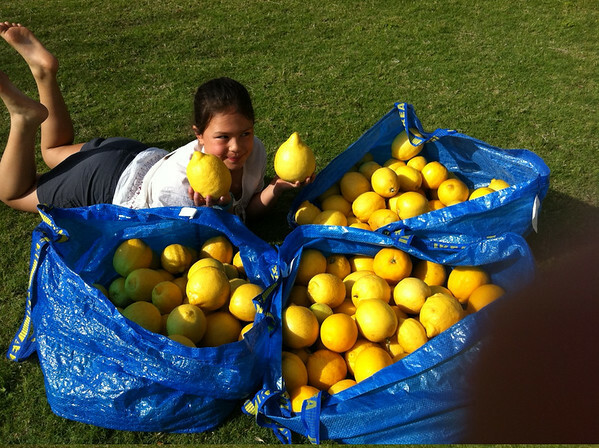 Pavlova's lemonade sale is on Wednesday and she has squeezed 25 litres of neat juice from the lemons. Every $16 you raise will feed a child a Mary's Meal for a year! I hope you can take our total to £114,000 because that's exactly the cost of a kitchen and 10,000 children getting a Mary's Meal everyday for a year. Thank you Pavlova and friends! Hope it's a sunny day for your sale. Good luck with the sale on Wednesday. I looove lemon juice, straight from the fruit. I'm also too far away, so here's another donation straight to Veg's Mary's Meals. You should sell bags of lemons too. I would buy some of those beautiful lemons! Good job Pav. The weather is just starting to get nice here in Melbourne. Would be the perfect time to buy some lemonade.